The October edition of FastCompany magazine is always my favorite (#BestDesignFC). It's the "Annual Innovation by Design Issue." This is the 10th edition of the design issue. I'm not a designer, I'm a marketing strategist. However, I fully appreciate the power of design and am saddened by the lack of respect given to the importance of design in creating an emotional connection to the brand. The best designers can determine opportunities to improve the user experience. Sharing ideas isn’t scary, it’s the way of the future. – Ben Kaufman, Founder, Quirky (#benkaufman). This is consistent with idea that the Internet rewards those who share and penalizes those that do not. It’s important to have a culture that doesn’t punish you if you make a mistake. It’s part of the innovation process. – Mauro Porcini, Chief Design Officer, Pepsico (#MauroPorcini). This is consistent with my belief that you should make mistakes early and often, just don't make the same mistake twice. With the explosion of social media and mobile, it is critical to ensure that your design is consistent with your brand platform across all channels so there's no confusion among your prospects or customers. Just because you have a computer with a graphics package, don't think you can do this yourself. Invest in great design to create a more powerful brand -- one to which your customer will become emotionally connected. Why Do We Need a “Vision”? What are we that we need to keep? What are we not, that we would like to be? Pepsi-Cola: Pepsi is the cola that is most in style today because it has the taste “with-it” people prefer. Volvo Automobiles: Volvo is the automobile that provides peace-of-mind to drivers concerned about the safety of themselves and their passengers. What other elements do you use to create the foundation for an integrated marketing communications plan? 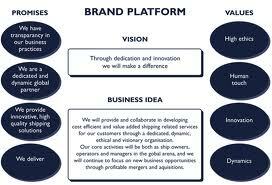 The third element of the brand platform are core values. Prior to the internet and growth of social media, I don't think companies gave their core values a lot of thought. However, today you better walk your talk or risk getting called out on social media. What are core values? My definition is, the unwavering principles that guide how we conduct business, make and sell products, and especially, how we develop and maintain relationships with customers and prospects. What do you need to consider when developing your core values? What values do we have now? What are we not that we would like to be? McDonald's core values are: quality, value, service and cleanliness. Pretty generic. It would be interesting to know how well their employees know, and agree, with these values. A lot of companies have core values but don't "walk the talk." Their values sound more like what you'd find in the boilerplate of a press release or the "About Us" page of a website. You might learn about them on day 1 or orientation but after that, it's just a meaningless plaque on the wall of the lobby. Zappos believes in having core values employees can commit to. Zappos hires and fires employees based on their core values. If you're willing to do that, you can build a company culture in line with the brand you want to build. You can empower your employees to be brand ambassadors inside and outside the office. What other firms do you know, or work with, that are "walking the talk" with regards to their core values? Tomorrow I'll cover strategic positioning.